A bespoke map can be a powerful solution to a problem that your bog-standard Google or Ordinance Survey map cannot solve. Oak Creative have created maps that have not only met the design briefs given, but exceeded all expectations and provided a basis upon which years of promotion and advertising has been based. 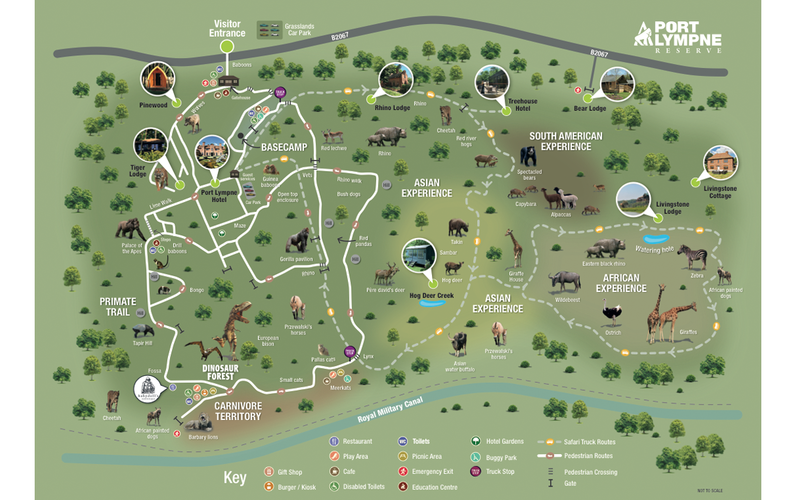 We’ve produced maps for Port Lympne and Howletts Wild Animal Reserves which appear throughout the park on signage and on various printed material, providing a representative map of where attractions, animals and facilities can be found throughout the site. As the two resorts’ size, attractions and branding have expanded over the years, so have our maps – we’ve been able to adjust our files to show changes such as the new Dinosaur Forest and the new accommodation options at Port Lympne. If you’ve ever been to Tenterden in Kent, you may well have seen one of our proudest illustrations – the Tenterden high street map. Featuring illustrated sights from around the town, this unique map was hand-drawn by Rick from site visits and photographs, then perfected and coloured in the studio. This type of map illustration does require significant investment, but the final product can last forever – Rick’s map is still in place – finalised and put up in 2003, it’s still there now 14 years on – only minor amends to the information over the years as various businesses closed and opened. You’ll also see his work at Tenterden’s Kent and East Sussex Railway where visitors flock to see and ride the steam trains. If it’s a bit of a mouthful explaining where your business is, a simplified map can go a long way. A picture can paint a thousand words as they say – and perhaps your business could benefit from a simple map in order to find your business.